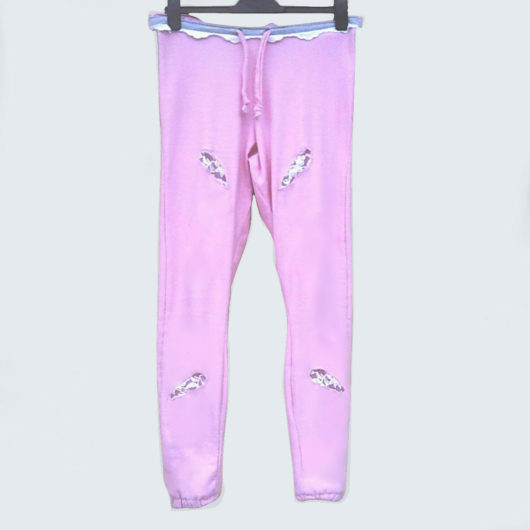 Jeans pants Fairy, Lys Majesty. Very nice pants, nice to wear with beautiful colors. Can be worn on all occasions, trendy style. Light blue jeans, mid-rise, with flowers of many sizes and colors, embroidered on jeans with embroidery in several pastel colors. Below the flowers and along each side of the legs, pastel shaped green, pink and yellow lace, is sewn into the jeans down to the bottom of the leg.